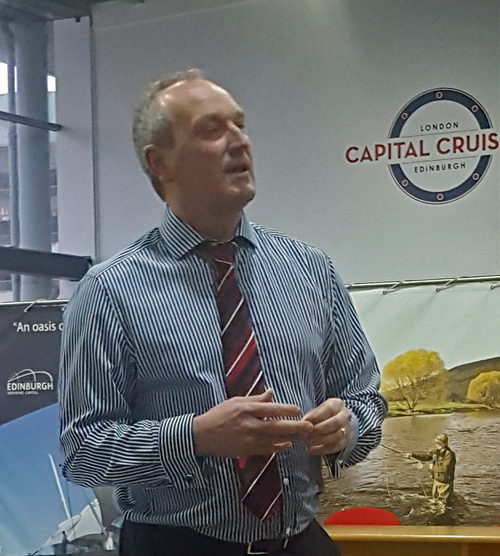 "The Port of Leith" by Kenny Williamson, Operations Manager Leith, Rosyth & Burntisland - Forth Ports Limited: Edinburgh meeting of 10 April 2018. The Port of Leith is Scotland's largest deep-water impounded port - and one of Edinburgh's best-kept secrets since where once mothers and father pushed babies in prams, there is now a modern secured working environment. Occupying 370 acres or 1.5M square metres, the Port can take ships of up to 50k tonnes or 210M in length, and is not just water but more like a small town containing dockside equipment, roadways, dry docks warehouses, storage land and offices. Commissioned in 1968, the lock entrance with three gates 259 metres in length and 31 meters wide is its beating heart of the port, and while older docks like the Albert and Edinburgh are 6 or 7 metres deep, the relatively newer Imperial Dock with is 9.15 metres deep and itself has 1395 meters of usable quayside berths which can accommodate various large cargo carrying vessels. The Port is equally happy accommodating smaller coastal ships in one of its 26 berths. Eight hundred years old and originating with the mouth of the Water of Leith, the Port played host until the late twentieth century to shipbuilding and ship repair, and the Henry Robb yard was still active until 1983 where the Ocean Terminal shopping and leisure complex now stands, with ships sent to the Alexandra Dock for fitting out. Cruise-liners now dock at right angles to the Royal Yacht Britannia, and when HMS Ark Royal was leaving from there in 1992 she knocked down two large lighting towers. The lock entrance is never left open to the sea as this would result in the locked port becoming tidal and emptying of water very rapidly as the tide turned. Rubbish entering the port from the Water of Leith must be carefully managed to avoid damage to vessels there pump and drive systems. The Tally Toor built in 1809 is one of Scotland's three Martello Towers to which people used to swim, but now it lies on reclaimed land in a secure area. Sector specialisms are agriculture, cargo, defence, oil & gas, construction, automotive and cruise. It is the former Britannia building, in use until the associated heritage centre was opened inside the Ocean Terminal, which now operates as the cruise-liner terminal, enabling the cruise market to be well-served by Leith where a couple of vessels can be simultaneously accommodated in the 570-metre berth whose maximum depth is 9.75 metres. Alternatives are Dundee or Rosyth, and larger liners must stable at Newhaven or transfer their passengers to tenders in the lee of the Forth Bridge, but Leith is the preferred destination for modern cruise liners of a size to make it in view of the proximity to the City of Edinburgh. The Capital Cruising offer includes the Port of Tilbury, also owned by Forth Ports. Leith used to have its own 120 tonneheavy lift crane for lifting items like locomotives, but now specialist equipment is hired in for cargoes of a similar weight like electrical transformers. It has one of the largest civilian dry-dock facilities in Scotland, and could not serve as a global gateway if it was not for the impounded deep-water. A locked port provides certainty with no worry about swell, and with proper procedure and planning a ship can be left unmanned at Leith. Transport terminals really enhance the Port, and two railheads which formerly handled power-station coal remain available for traffics such as pipes, for which the Port has a coating plant. The skills that it develops have updated from the days of riggers to mechanical engineers, with apprenticeships and a graduate programme. Handling oil and gas pipes requires particular expertise, and a large wind turbine jackets have been assembled within the Forth Estuary and stored on-site within Leith for onward shipment the Beatrice wind-farm. The Forth Ports family comprises Grangemouth, Rosyth, Leith, Dundee, Methil, Burntisland and the reopened Kirkcaldy in addition to Tilbury, and has 450 employees in Scotland (just under 100 of them at Leith) plus 500 south of the Border. An effective collaborator with national and local government, local communities, the education sector and trade bodies, Leith is Scotland's Capital Port, a long-time supporter of the proposed Edinburgh Tram extension, and offers extensive road and rail connections also to Glasgow, Aberdeen, Dundee and Newcastle. People tend to stay with Forth Ports, and Kenny Williamson who is now operations manager for Leith, Rosyth and Burntisland started with them as an apprentice in 1983. Report and photograph by John Yellowlees. You can read reports of the most recent Scottish Region meetings, visits and events by clicking on the links below. For older reports of meetings, visits and events in previous sessions, please go to the "Archives" section.